New Year’s Blowout Magazine Subscription Sale – Today Only! This weekend Discount Mags is having a New Year's Blowout magazine subscription sale where you can save more on longer subscriptions! Remember you can gift magazines to your friends or get these as a new subscription or renewal for yourself!Have something else in mind? 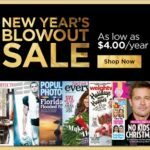 Use coupon code … [Read more...] about New Year’s Blowout Magazine Subscription Sale – Today Only! I just wanted to take a minute to wish you all a Merry Christmas, Happy Chanukah, Happy Kwanza, Winter Solstice and Happy New Year. I hope you all have a very peaceful and warm holiday season and get to spend time with your loved ones. From me to you! 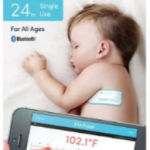 -Alli … [Read more...] about Happy Holidays To All! Last Minute Gifts Magazine Subscription Sale! This weekend Discount Mags is having a Last Minute Gifts magazine subscription sale where you can score sale titles for as low as $4.75/year! Remember you can gift magazines to your friends or get these as a new subscription or renewal for yourself!Have something else in mind? 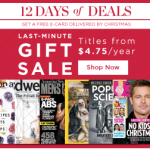 Use coupon code … [Read more...] about Last Minute Gifts Magazine Subscription Sale!